All photos vis Race Cars Direct. Are you there, God? It’s me, Stef. I don’t ask for much, but I just picked up a weird rare Volkswagen race car and its humble flat-four engine is woefully broken. 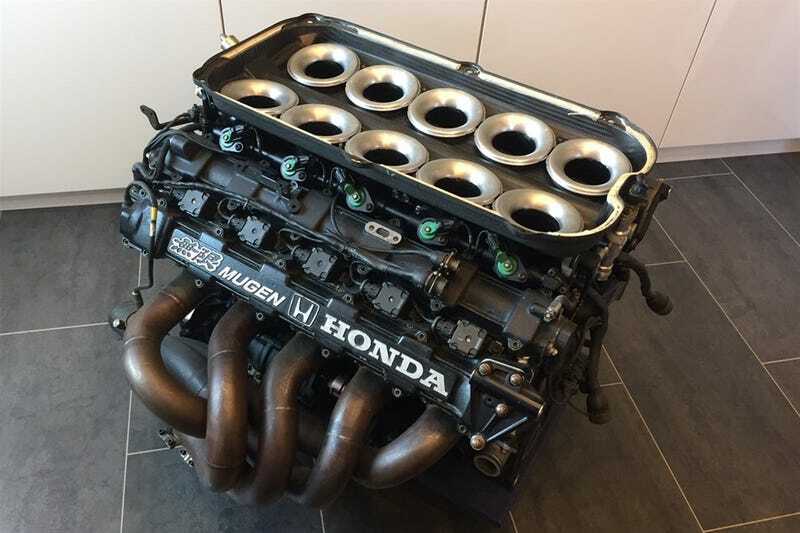 All I need to do is find €10,000 and I can replace it with a Mugen-Honda MF-351 V10 from a Formula One car that’s up for sale on Race Cars Direct right now. Really. That’s all I want. Normally, I’m a stickler for keeping things I do to my car in the Volkswagen family—especially where fine vintage aircooled machinery is involved. I have a handful of exceptions for this, and most of them involve stuffing a Formula One engine into my Volkswagen’s trunk. Few details were given in the ad about this Mugen-Honda MF-351 aside from a pair of years: 1993/1994. Mugen built Honda engines for the Footwork and Lotus F1 teams during that time that produced around 700 horsepower, Road & Track notes. The ad does not specify which team (if any) used this engine, so if you’re that picky, you should probably just let me have it instead. Footwork and Lotus certainly never set the championship on fire in those years, but these growling, howling V10s sound so lovely that I’m sure few would care. Given that Mugen was Footwork’s first full-year replacement for Porsche as an engine supplier after the Porsche engines were a Honda-V6-hybrid-grade flop in 1992, it makes total sense that this vintage F1 V10 would replace my VW’s Porsche 914-related flat-four. Please, eight-pound, six-ounce Baby Race Car Jesus, let me acquire the roughly $12,000 (U.S.) to mount this piece of Formula One history in my race car’s trunk. I mean, I’m not even asking for much. A Toyota Yaris costs more than that, Big Man. I’d promise to use it for its intended purpose, too. It specifies on right on the top that it’s not a tool tray. I couldn’t just leave it sitting in my living room with all my other cast-off race car parts because that note all but requires that this engine be used. Alternately, if someone wants to just surprise me by making my car wholly undriveable in the best way ever, just go to this listing right here. My car’s at the track. Its engine goes in the rear. Thanks in advance. What Would You Do With An F40 Engine And Transmission?